Darkness arrived early in Hanoi, not because of winter solstice but nimbus clouds hovering the city. A tropical depression will be joining us on our Hanoi Evening Street Eats food tour, our guide stated. I was the first one to arrive at Silk Path Hotel followed by an American and two Canadian couples. At first, I was intimidated by the group composition because all of them are above 40 years old. I had no issues with that because I know a lot of people still active traveling beyond their forties. My worries were on how the conversations will be. It was funny because I was the youngest in the group and the oldies got interested on how I travel. We had few conversations with them asking the destinations I’ve been on my hundred-day trip in Southeast Asia. Moving on, from Silk Path Hotel, we walked for around a kilometer in our colorful rain ponchos. 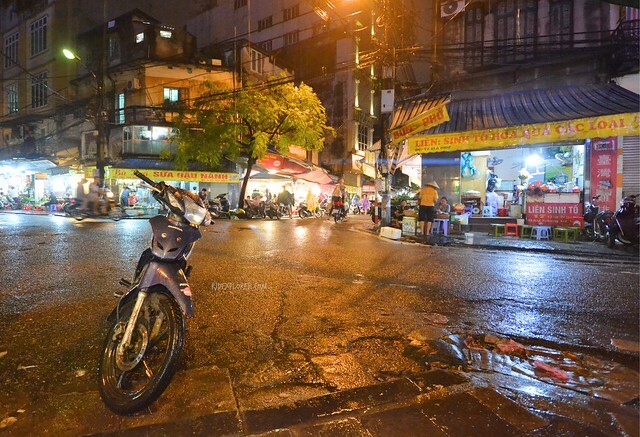 Hanoi’s wet streets were still avenues for blazing motorbikes. Since it was a walking tour, our guide, Frank, was helpful enough to wait and stop vehicles when we needed to cross the busy streets. He has some spiels on few parts of the tour explaining bits of information on Hanoi’s history, commerce, sometimes property acquisition, and taxation. 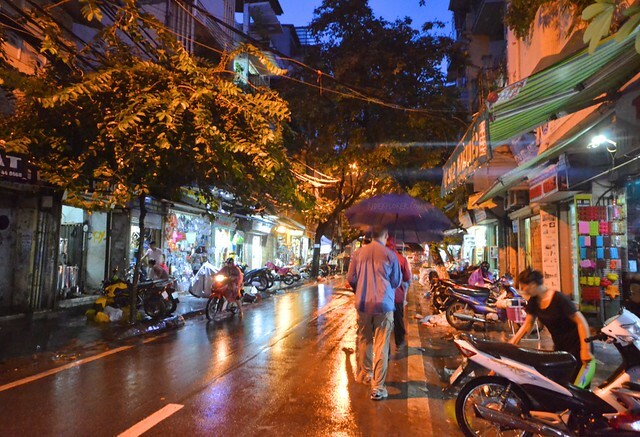 Rainy Hanoi during the evening food tour. One of the Canadian ladies already asking the guide how many meters more for the first food stop. I was about to second the question because I was already starving that time. The guide responded, “A hundred meter”. We skipped the slippery roads and afterward found ourselves on low stools ordering a bowl of pho. The owner of the restaurant was busy inhaling some smoke from the bamboo water pipe. When the group arrived, he vacated his seat and offered it to us. “Chicken or beef?” Our guide exclaimed waiting for everyone to pick their much-awaited piping hot bowl of noodle soup. The tally started and I had my preferences on the beef group. A bowl of pho bo, perfect for the rainy weather and my famished stomach, appeared in front of me after a minute of waiting. Squeezing a quarter of lime and plunging few slices of red chili were the next steps I did to create a perfect first meal on the food tour. The first slurp was remarkable. 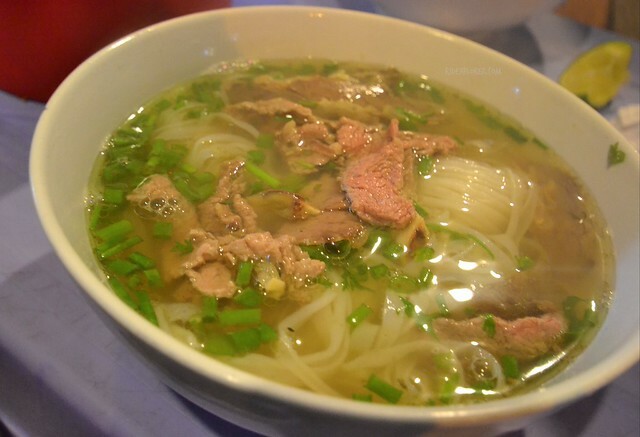 The savory broth was one of the best I’ve tried on my dozen bowls of pho in Hanoi. It was not too oily yet the long hours of boiling the meat make the broth so satisfying. But adding the spices and leafy herbs created a symphony of flavorful beef noodle. I said that I wouldn’t be consuming all of it since it was only the first stop but I wasn’t able to resist myself slurping everything in my bowl. Continued walking and dissecting the streets of Hanoi Old Quarter, the guide led us to a façade of a building where a narrow alley is bordered by bright shops. A lady was busy frying spring rolls in a regular-sized pan. The rolls were displayed in a small tray where the other lady gets the fried spring rolls and putting them directly in brown paper bags. 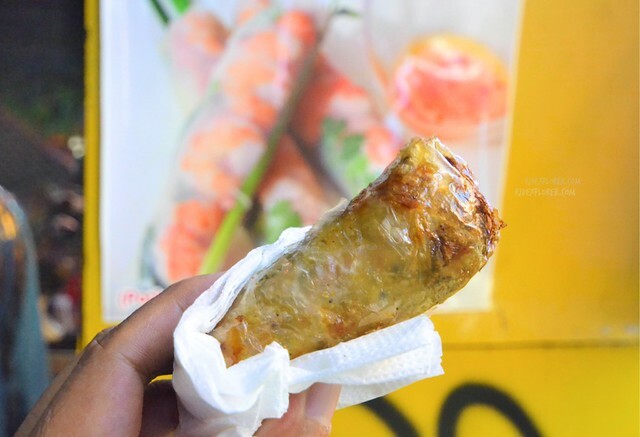 On our case, each received one fried spring roll wrapped in a tissue paper for sampling. I’m not a fan of fried spring rolls but I didn’t expect that I would love the combination of well-seasoned vegetables and meat (not sure) wrapped in crispy rice wrappers. The guide asked if we still wanted additional but it was already late for me to say yes because I was enjoying the spring roll and savoring every bite of it. Beer is also a thing in Hanoi. There are few brands like Bia Ha Noi and Saigon. But Frank brought us at an intersection and allowed to sit on low stools. The lady immediately went to her metal barrel and filled seven plastic cups with draft beer. 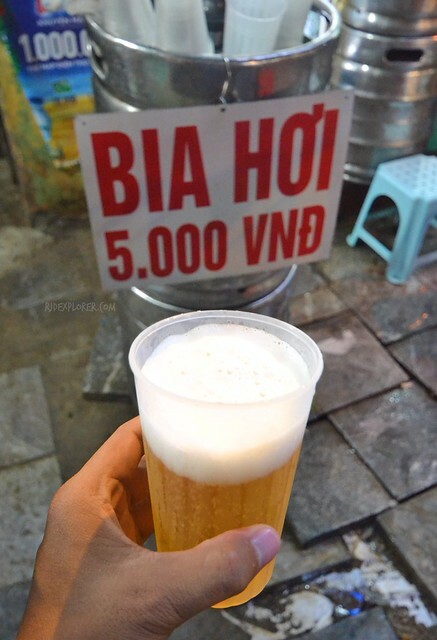 When I take a look at the barrel, a sign was posted shouting “Bia Hoi, 5,000 VND.” That would be a quarter of a dollar for the glass of ice cold draft beer. We spent few minutes at the sidewalk ordering unlimited beer watching the nightlife in Hanoi Old Quarter slowly unfolding. Beer for VND5,000 a cup! I know it was a bit weird but we had the beer first before the Vietnam’s famous banh mi. It was fine because we still have spaces to fill in our stomach. 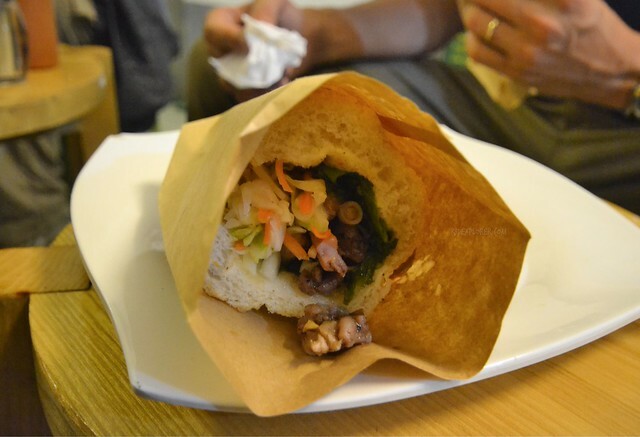 The banh mi place offers several versions of banh mi from pate eggs, beef strips, duck and chicken, and pork. Rates start from VND15,000 to 30,000. The banh mi shop uses a crisp-crust bread which is a little larger than the other banh mi sellers. I wasn’t able to get a better photo because I was too excited to try this roasted duck banh mi. I decided to just get a half of banh mi ngan, or roasted duck. The serving size of the banh mi is actually for sharing. The seller won’t ask the customers for any preferences on the contents of the banh mi but it was reassured to us by Frank that it’s one of the great places to get one in Hanoi Old Quarter. The praises I heard was confirmed by the bread itself. I was able to finish my half and wanted for more but I decided to skip to make space for desserts. 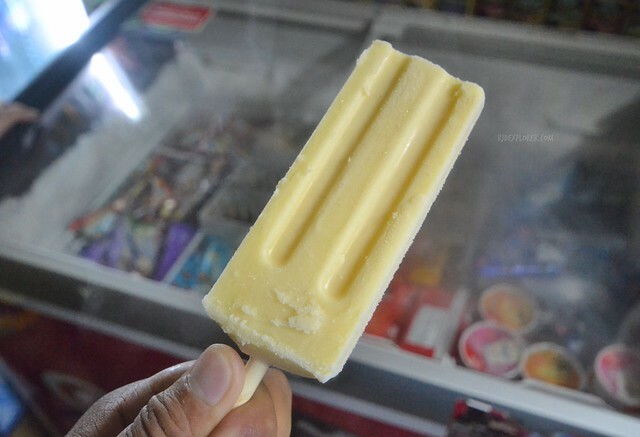 The end stop on the food itinerary available on Klook was Trang Tien ice cream shop. However, since it was raining heavily during the tour and the location was a bit off from our accommodations, our guide decided to divert the route. He looked for a store where we could have the famous Hanoi ice cream brand, Trang Tien. Trang Tien green bean ice drop. The ice cream, more of an ice drop, is available in green bean, coconut, and vanilla flavors. Everyone in the group got coconut but I preferred the green bean. So far so good but I expected for a soft-serve ice cream scoops on a crunchy cone. Anyways, it was a fun and cold way to end a rainy night food trip in Hanoi. Most of my posts here, even on food, are more on like a do-it-yourself way of exploration. But for Vietnam, where tons of vendors selling same meals are available, it’s hard to pick the best spots to get a specific dish unless you try everything or you have a local friend who could assist and guide you. 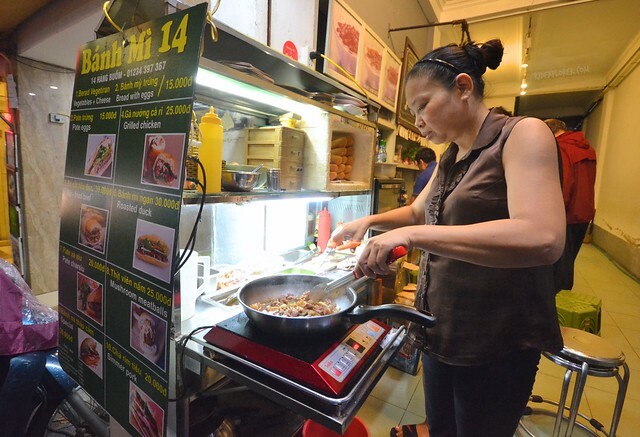 Similar to the Saigon Food Tour I had on my trip to Ho Chi Minh City, the Hanoi Evening Street Eats is really the easiest way for me to try the best places to get certain and must-try food in Hanoi. Another thing is, since I travel solo most of the time, this kind of organized tours allow me to meet travelers of different race, age, and culture.